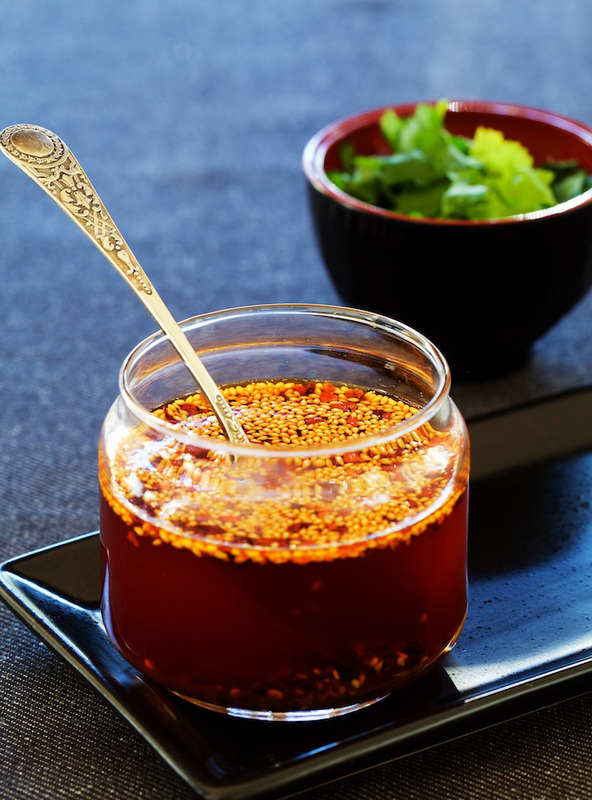 Spicy oil is the soul of Lanzhou beef noodles and is its main characteristic. 10 g Paprika. This chili powder is not too hot; its main purpose is to color the oil. Korean chili powder is also good. If you can’t obtain either you can leave them out, but the color of the spicy oil will be lighter. Take a small soup pot and add the rapeseed oil, pepper, star anise, fennel seeds, coriander and bay leaves, and cook on low for 10 minutes. 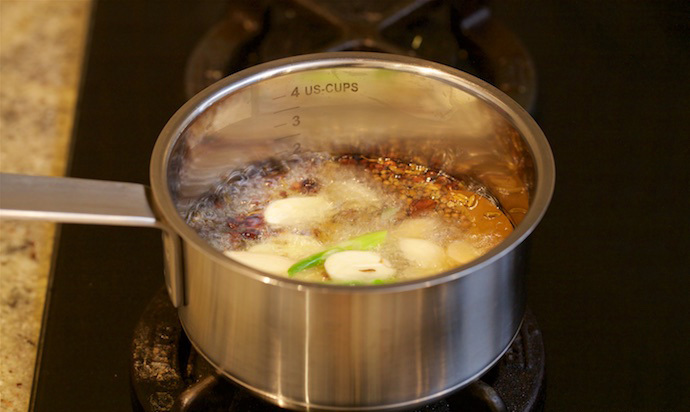 It is important to keep an eye on the mixture so the spices do not burn and become bitter. Adjust the heat lower to prevent this. You may need to remove the pot periodically. Before adding the sliced ginger, garlic and onion, dry with paper towel to avoid oil splattering. Add them to the hot oil and continue to heat on low. When the onions and garlic are golden yellow and float to the surface, stir gently with chopsticks. Check the temperature of the oil. It must be between 150-155 degrees for best results. If the temperature is below 150, turn the stove up a little, if higher, turn it down or off until the temperature stabilizes. If the temperature goes above 155 the pepper will burn, and if it is lower than 150, its flavor will not be released, and the other spice flavors will dominate not giving the right flavor to the oil. 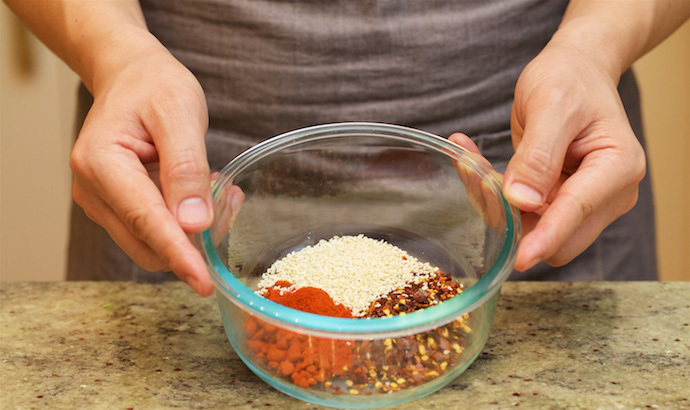 In a heat-resistant bowl put the chili flakes, Paprika and sesame seeds. Chili flakes add spicy aromas, and Paprika adds both spicy aroma and a strong red coloring. Sesame bolsters the nutty oil aroma. 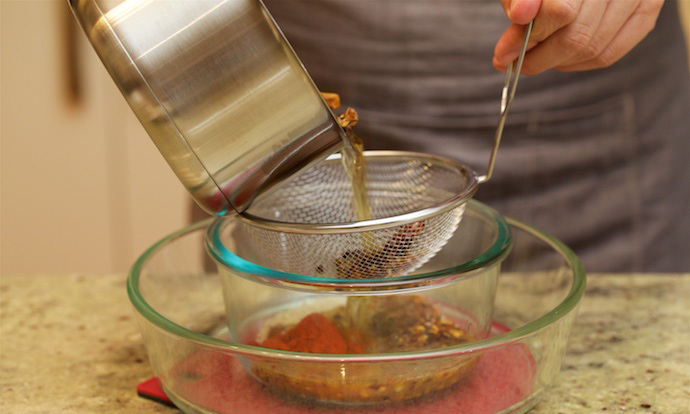 Place this bowl inside a larger one to catch any spillage when doing the next step. 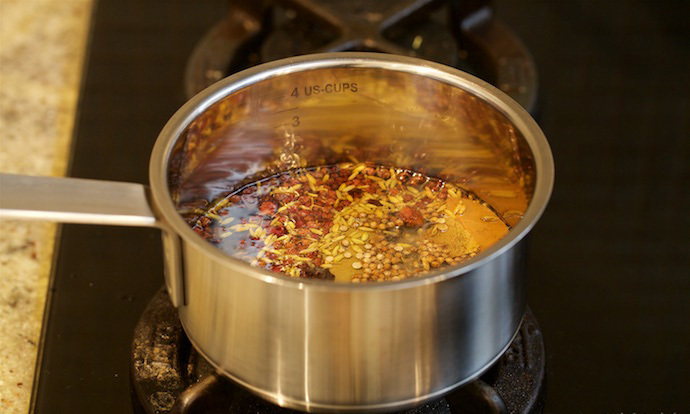 While the spicy oil is between 150-155 degrees Celsius, strain the hot oil through a spoon sieve onto the spices in the bowl. Pour slowly to avoid foam rising and overflowing the container. Finally, stir with chopsticks, allowing the chilli to break down, and the hot oil to coat and release the spices’ aroma. 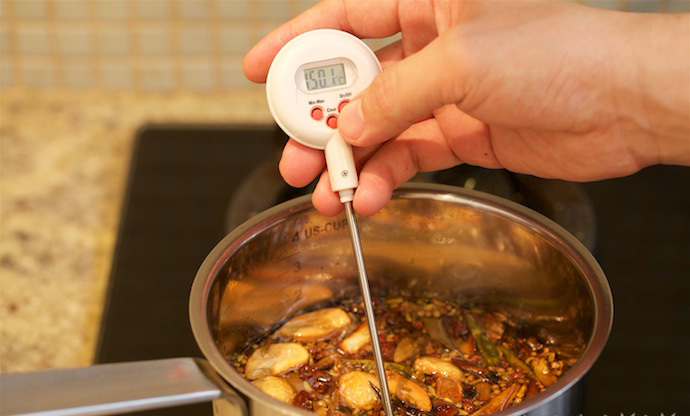 Spicy oil needs a high temperature to cook well, so please take care when doing this step. Keep your children away in case any oil splashes. Yumofchina.com is a participant in the Amazon Services LLC Associates Program, an affiliate advertising program designed to provide a means for sites to earn advertising fees by advertising and linking to Amazon.com.